Deciding what cookware set to buy should not be taken for granted, especially in 2019 when thousands of models are available for purchase. We cannot deny the fact that we prefer cheap utensils and plates, cheap woks, etc. over those that cost twice or thrice as much. The logic behind this mentality is that they’re just objects for cooking or heating purposes, why spend hundreds of dollars? However, practically speaking, it will cost more to buy low-priced kitchen utensils that will not last a year, or even less, than something that may require a little more investment but could last for 3-5 years, right? When purchasing a product, we should not be evaluating only the price, but it’s quality as well. If you are in a hurry, click here to see best-selling pots and pans sets on Amazon.com! In this review, I will be explaining to you mommies, daddies, or whoever is in charge of preparing your family’s meals, the different types of kitchenware sets, together with its advantages and disadvantages. There are no biases; everything that is written is real and based on facts. Let’s begin with learning about a few of the best pots and pans sets in different price ranges and for different budgets – below $100, $200, and so on. If you are looking for information about cookware types and brands, please scroll down. We will get to it. 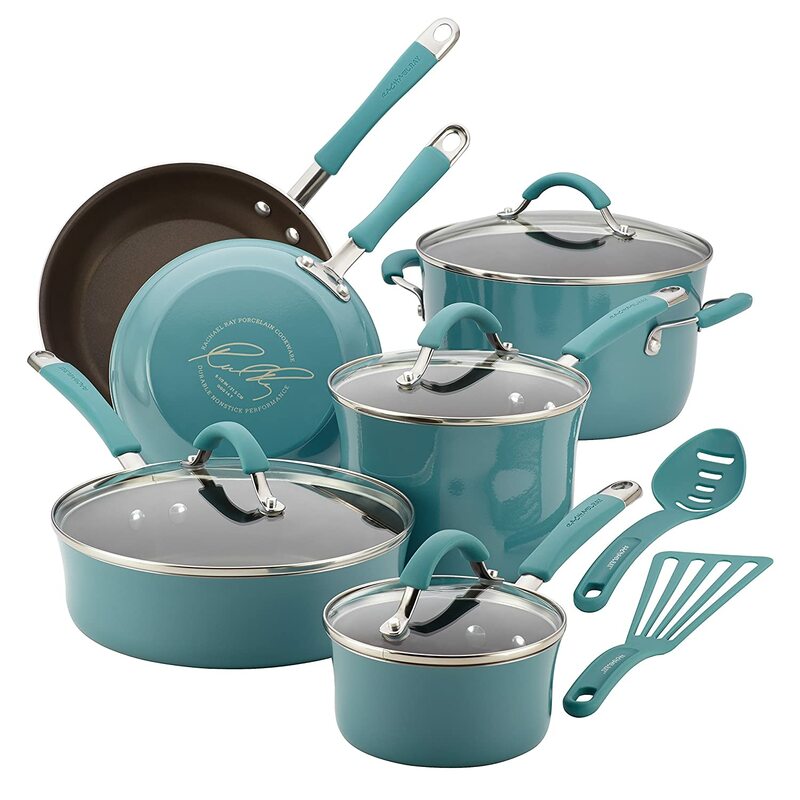 I had chosen the Rachael Ray Cucina Hard Porcelain Enamel Nonstick 12-Piece set (see below) as the best pot and pan set in the low budget price range below $100. And then I noticed that the price had gone up. So I had to return to Amazon.com and keep searching for the best cheap cookware sets for reviewing. The T-fal C969SE Excite is a great aluminum nonstick cookware set. After finally ordering a set, I have noticed that it’s convenient for my glass top stove. I also found that the cookware set is suitable for ceramic top stoves as well. You can expect a 5 quarts Dutch oven, a 2 quarts saucepan and a 1-quart saucepan in the cookware set. The fry pans you will be buying are 10.25 and 8 inches in diameter. All the pans and the oven come with a separate lid, of course. Although it is partly made in China worried me about its durability, I have no complaints yet. I found the cookware set to be decently durable. You can also expect the color to not fade anytime soon. You can use the handles while cooking since they are non-conducting. If you ever find the handles are coming loose they can be easily tightened, which is a neat little trick. Although it happening at all is very rare and the handles usually serve for a fine duration. As mentioned, this cookware set can work great whether you have a gas stove or an electric. You can also use them in ovens. I have used mine for up to 350 degrees Fahrenheit. The good news is, they are also dishwasher safe. You can cook in this particular set without worry since the interior is coated with a non-sticky layer. You will find measuring spoons too and it comes with a 1-year warranty. 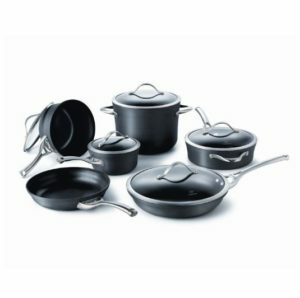 However, anyone looking to buy it for use with an induction stove is making a wrong decision; this set is not induction friendly. 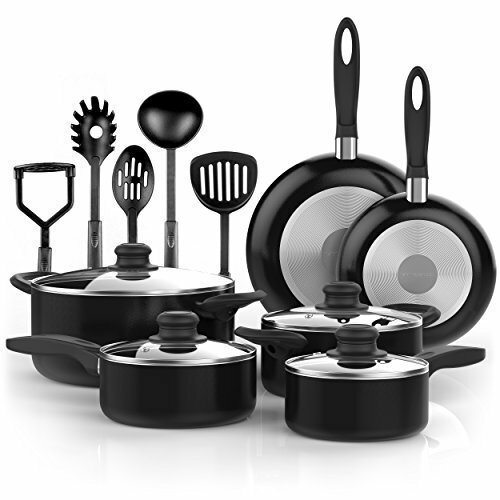 The Vremi VR0046 15 Piece Non-Stick set is a personal favorite of mine since the set has an impressive size for the price that it comes in. Since the brand is rather new, I had to do some digging before finally buying a set for use. You can expect the frying pans to be 8 inches and 10 inches in diameter, although it may vary a bit. You will find it easy to seal the pans and Dutch ovens with the lids customized for each of them. The utensils are actually very fun to experiment with since the pans and ovens are non-sticky coated. It is safe for use in ceramic and glass top stoves. You can expect using them will not get any scratches on the stove. One of the best things about this huge set is that all of the components are dishwasher safe, making cleaning as convenient as possible. You can use them without straining your hands since they are rather light and even fun to use. Though the color will fade if used on a gas stove, for ceramic and electric stoves, the color stays intact for a very long time. It is a good fit for use in the oven. The materials used for preparing the pans are completely oven safe. I even used them in my oven and I am satisfied with the cooking. Once again, this set is not fit for use with an induction stove, which would be a terrible thing to find out after purchase. I have selected two cooking utensil sets in the price range under $200. 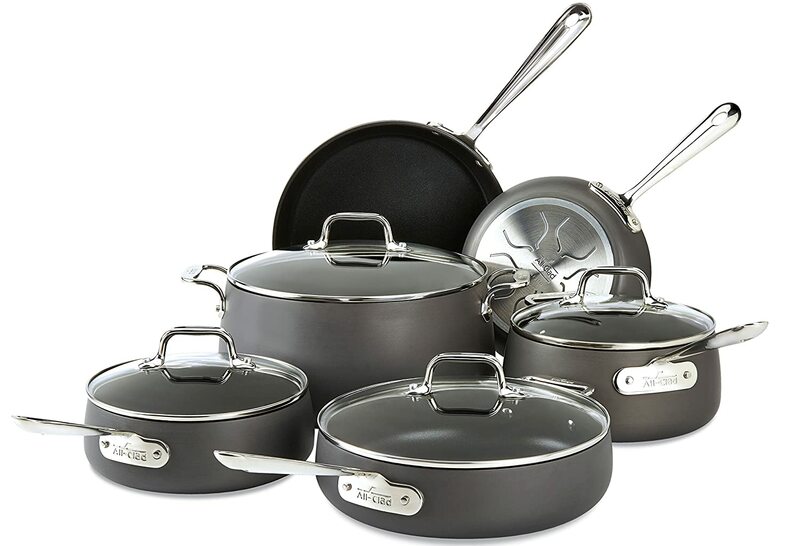 This 12-piece kitchenware set includes two covered saucepans, one covered stockpot, two skillets and a sauté pan. Two utensils are also included – a slotted turner and a slotted spoon. The set’s sturdy enamel porcelain surface is what enables it’s users to cook up to maximum heat (oven safe to 400 degrees Fahrenheit). The Rachel Ray Cucina set comes in simple and basic warm colors (listed below), according to its primary function: increasing the amount of time the food can be heated and stays heated. All utensils are nonstick (as the name itself would suggest) so the food does not stick, doing the cooking and cleaning the mess afterward incredibly easy. 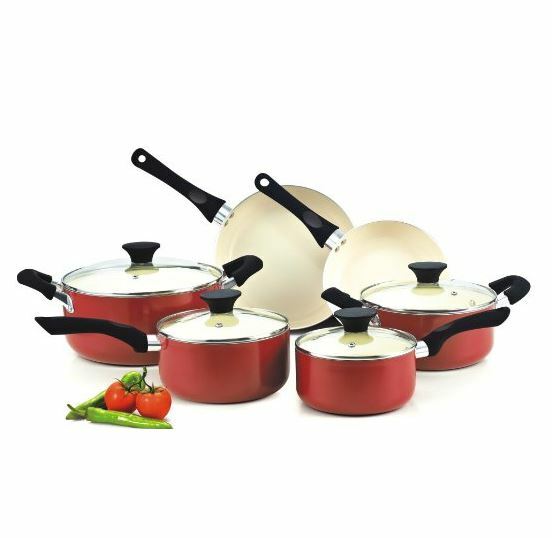 This Rachel Ray set is also well known for its durability; it has been designed to withstand both maximum heat and use. Even after years of use, you can expect the items to remain as functional as new; many customers are amazed about how the paint still has not peeled away! As long as the set pieces are always cleaned after use, you may be assured that the product will have years to go by before it has to be discarded. Additionally, the glass lids are shatter-resistant, and the steel handles have been rubberized, so users do not have to worry about their hands being burnt off since the handles do not get hot very quickly. This is a 13-piece cookware set, which is comprised of two fry pans (an 8-inch and a 12-inch), one 12-inch covered fry pan, and three saucepans and a covered stew pot. The T-fal C836SD has been crafted with stainless steel, and the set pieces have a base with multiple layers and a copper bottom. A copper bottom ensures that the food is being cooked at an even and fast heat wave. The cookware set’s overall stainless steel is instrumental in keeping intact the stain grey surface of T-fal C836SD, no matter how much it gets used. It is the specialty of this set; the steel construction offers long-lasting durability even at maximum use. The handles are also built in stainless steel, ensuring it will never get hot to the touch. In addition to the outer stainless cover, the handles are too riveted in silicone, making them easy to use and clean as well. The pieces are nonstick both inward and on the outside, so you should have no trouble getting the mess off in no time. Another good thing about the T-fal C836SD is that despite carrying all these additional facilities, it weighs no more than you would expect it to. They are neither too heavy nor too light that it will slide right off the stove. The T-fal C836SD set will prove to be a long-term investment. It will give you your money’s worth! 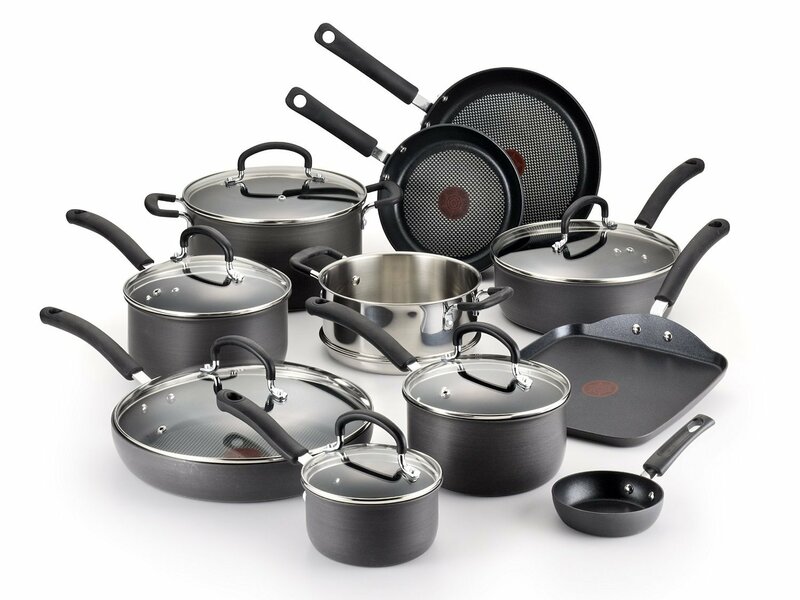 The T-fal E765SH Hard Anodized Titanium set is a dream-come-true for the everyday user! 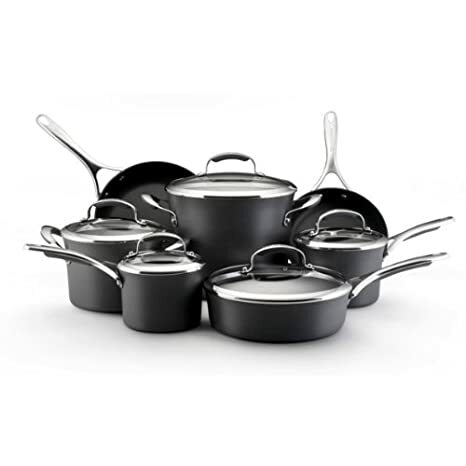 It is a 17-piece set and as the name would suggest, the aluminum make on the surface is hard anodized, making it the ultimate durable kitchenware product. But that is not the feature that makes the T-fal E765SH so desirable; a unique function is its Thermo Spot heat indicator which alerts the user as to when the pan has been properly preheated. If you add food to the pan only after it is ready to cook, it enables the food items to retain their original nutrients in the finished food dish. The interior is stainless steel, making the cooking process easy and fast. According to the users, seasoning pans, which are stainless steel, is also a less challenging task. Along with the preheat option and the non-stick durability, the T-fal E765SH is a no-brainer when it comes to selecting long-lasting cooking utensils. As an additional treat, it also comes with glass lids installed with steam holes. This way, the user can always keep a watch on the processing of the food dish. So, take your pick today; you only have to choose a color because, among the 17 pieces, it would be hard to find a pan that you need but is not included in the list for the T-fal E765SH. When it comes to such a multifaceted item that is prone to last longer than most others, a price tag of around $300 should not be an issue of hesitation. This 8-piece set consists of two omelet pans (a 10-inch and a 12-inch), two covered saucepans; a covered sauté pan and a covered stockpot. This utensil collection is everything you need to get through the day-to-day culinary routine. The Calphalon Signature set is easy to use and clean as if it were crafted in the art of stainless steel. But, no, it is not. Instead, it uses a Signature Sear Nonstick Interior construction, which is just as effective as steel. People with heart conditions may be advised to use this set since the nonstick properties are a great way of implementing low fat and healthy cooked dishes. Along with the main pieces, there are also 2 long silicone riveted handles that are never hot to the touch. What makes the cooking process even more comfortable is the tempered glass covers. These see-through covered pans enable you to monitor your cooking without having to open the lids numerous times and thus, running the risk of the food getting cold. 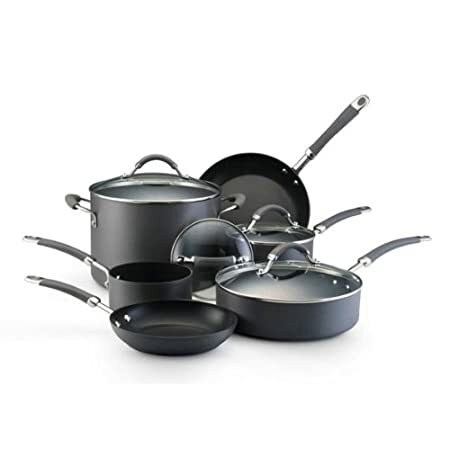 According to customer reviews, what is probably the best thing about the Calphalon Signature Hard Anodized Nonstick Cookware items is that they can withstand the pressure of metal utensils. Now, you no longer have to compromise with wood or silicone utensils to avoid the risk of ruining your cooking pan or pot. With all these various facilities, this cookware collection is hands down the best one in the price range of $400. We dare you to find a better one! The All-Clad E785SC64 is all clad with 2 fry pans (one is an 8 inch while the other is 10 inch), 2 saucepans with closed lids, a sauté pan with a lid and a stockpot with a cover as well. 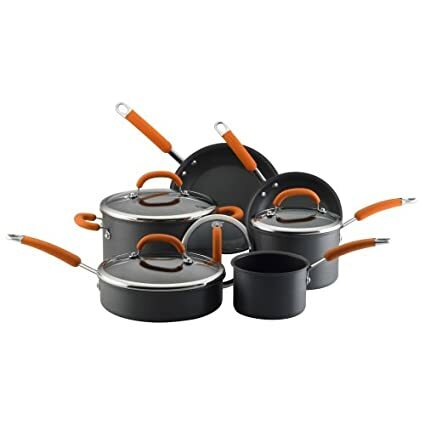 This set has excellent features: a hard-anodized aluminum surface with a nonstick interior which can heat food up to 500 degrees without causing any kind of damage to the utensil. So, what else does the All-Clad E785SC64 bring to the table? You may find only a few cooking utensils on the market that comes with the option for induction cooking. Well, the All-Clad E785SC64 is specially designed for this particular function, which brings everything into perspective, namely the price. There may not be many manufacturers who dare to charge as much as $500 for their kitchenware collections, but there are also only a few that can use induction technology. The pots are also high quality and emit an equally high quality of even heating that seems to exude from within the food while it is cooking. It makes sure that the nutrient properties of the food items are not lost and are instead locked into the final dish. Another additional feature is the shape of the pieces themselves; they all have a specific cauldron-like form which helps a great deal in keeping the balance while the user is stirring or sautéing the food. If you’re looking for an affordable kitchenware set that is easily cleaned and heats up faster than any ordinary kitchenware, then you might consider ceramic kitchenware . I will not go into the detail about this type of cookware in this review because I have published dedicated best ceramic cookware review. But if you think having ceramic kitchenware makes you feel something is missing and the stainless steel utensils are too pricey for you, why not try the hard anodized kitchenware? It has a built-in Thermo-spot heat indicator that signals you if it is correctly heated and ready to cook on and a TechnoResist Anti-Warp base that resists any kind of warp that helps in the distribution of heat without overheating your food. It is like a combined ceramic and steel kind of kitchenware. It is scratch resistant and has a non-stick surface but at the same time pro-metal, where you can use metal or silver utensils without leaving a mark or scratch. You can execute all cooking method EXCEPT induction. One of the most popular sets of this type is coming from Rachael Ray. Now that you already know the differences between each cookware type, have you chosen what you really want? Cooking will be more comfortable and safer with the right equipment. If you get inferior cookware, you might just end up with food that takes too long to cook or food with less nutritional value. 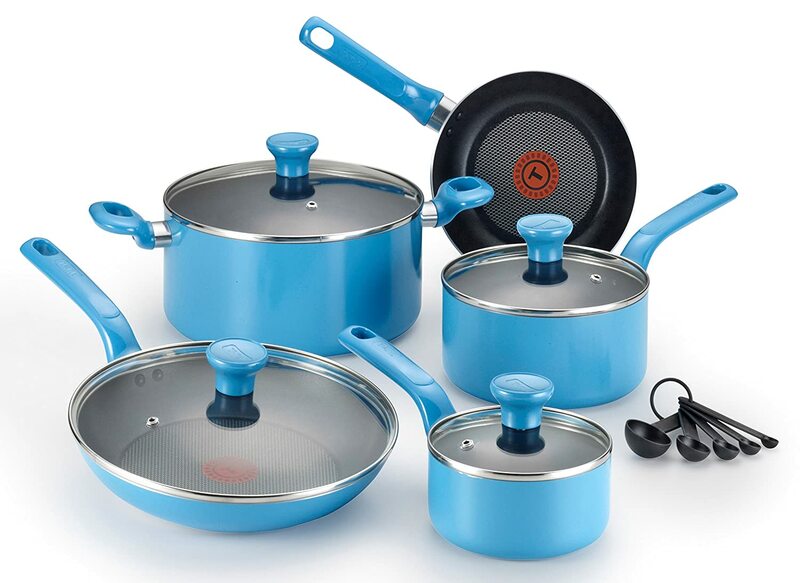 To prevent you and your loved ones from wasting the food value, different brands carry hard anodized cookware. These are nonstick utensils made with premium aluminum construction. Not only do you make good food because of the right temperature and even cooking from this cookware, but the stay cool handles also keep your hands away from burns. Remember that some of these kitchen utensils should not be washed in your dishwasher. Anyway, you won’t be spending so much time scratching away because of the nonstick surface of hard anodized cookware is very easy to clean. These are durable cookware that has a lifetime warranty. So, there will be a big help to you when you are immersed in your passion which is cooking. You may not be a big fan of Rachael Ray, but Rachael Ray cookware sets surely are a big hit. This set is being made with hard-anodized aluminum for quick and even heating. The silicone grips offer secure handling, and the glass lids allow you to monitor your cooking. 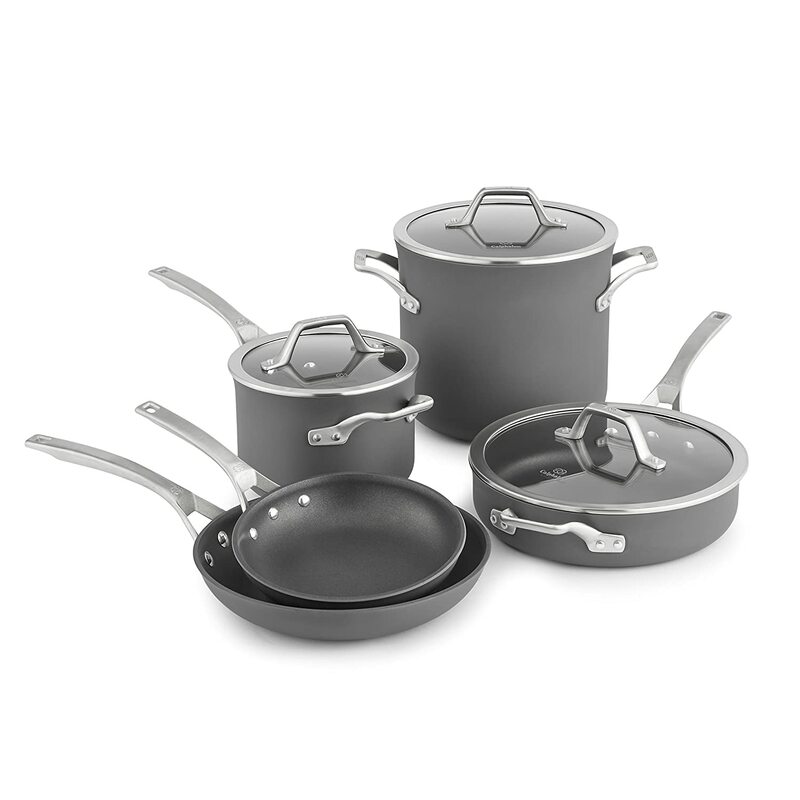 Cook like a pro with this 10 piece set from KitchenAid that has a scratch-free surface for better food release. These nonstick cooking utensils will help you cook better food for your family. They have glass lids that are break-resistant as well as dual riveted handles with silicone grips. Prepare your meals in using this KitchenAid 82545 cookware set and find out that it is quicker and better! The aluminum heats fast and evenly for proper cooking. Also, the glass lids seal in the nutrients since you do not have to open it now and then just to check. 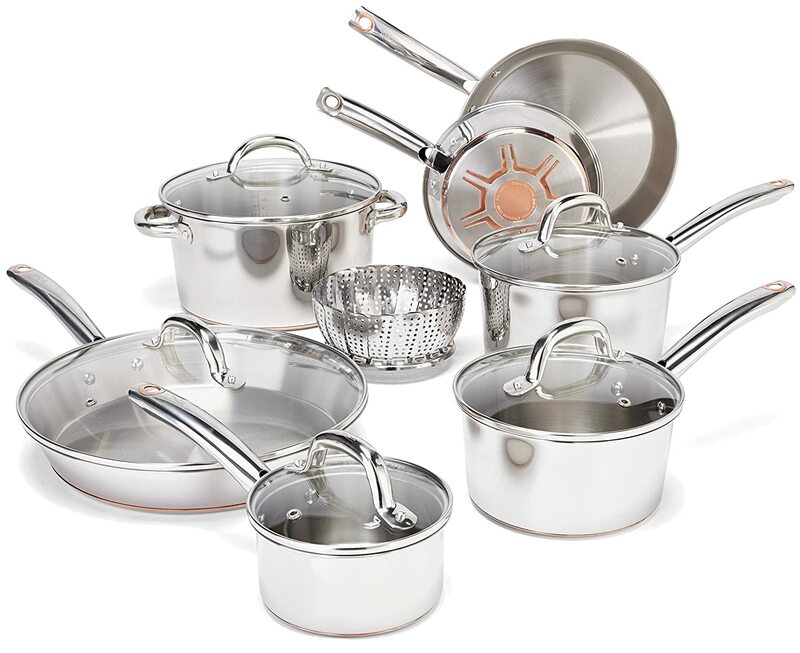 There are many types of cookware that are suited to different uses and styles of cooking. It’s important for a successful cook to have the right equipment. Many cookware sets are available, but mixing and matching different brands or materials to make a personalized set is also a popular choice. Aluminum cookware is strong, lightweight, inexpensive, and a great heat conductor. It is often combined with other materials for reinforcement. Aluminum on its own is reactive with acidic foods. Cons: uncoated aluminum reacts with acidic foods, not suitable for induction, lighter weights may warp when heated. Anodized aluminum has been processed so that the surface is hardened, making it non-reactive with acidic foods. Popular Brands: Calphalon, Cuisinart, Mauviel. Cast aluminum cookware is made by melting aluminum and pouring it into a mold. The result is a strong, lightweight piece of cookware. It is usually coated with a non-stick surface. Popular Brands: Swiss Diamond, Scanpan. Cons: Poor at heat conduction unless it is combined with another material. Good heat conduction comes at a price; stainless steel can be expensive. Popular Brands: Le Creuset, Cuisinart, Chefs Essentials, Demeyere. Copper cookware is very responsive to heat adjustments. It’s lightweight and is a great heat conductor. Copper cookware can be very expensive. Ceramic bakeware is available in many shapes and sizes. It heats gradually and is perfect for dishes that need to be cooked slowly. Carbon steel (also called black steel) is a combination of stainless steel and cast iron. It’s ideal for high temperatures and is often found in woks or baking pans like Matfer Bourgeat black steel frying pan. Cast iron is possibly the most versatile type of cookware. It is made by pouring a combination of molten iron and other materials into a mold and then allowed to cool. Because it is molded, it will not warp when being used at high temperatures. Enamelled cast iron is made the same way as cast iron, but is a bit lighter. The enamel coating makes it non-reactive with acidic foods. Pure titanium is very light, strong, and versatile. It is popular among backpackers and hikers who only need to heat water for rehydrating food. Titanium reinforced cookware is made with a cast aluminum base, allowing for fast, even distribution of heat as well as good retention of heat. This base is coated with a ceramic cooking surface that has been infused with titanium. This coating ensures a better cooking surface and increases the durability of the cookware. In addition to the brands mentioned in this review I want to mention these cooking utensils manufacturers – Cuisinart, AmazonBasics, Vremi, Cook N Home, GreenLife, Simple Chef, Copper Chef, Heim Concept, Paula Deen, Calphalon, Chef’s Star, Copper Pan, Deik, Circulon, Cooks Standard, GreenPan, Wolfgang Puck. Each of them offers something unique. I can promise you will see many of these names in the upcoming reviews. I am looking into different types of cookware – ceramic, titanium, non-stick – and considering reviewing each type separatelly. People are also asking which is the best pots and pans set under 1000 dollars, so I might look into it.